As a work-from-home-er and a music fan, having good audio in my home office is important. Until recently, I’ve used my laptop to feed a two-channel amp and some decent speakers. A large collection of digital audio, combined with MPD means I basically have a personal radio station with no commercials that only plays stuff I like. I just turn on the amp when I want to hear it, turn it off when I don’t. It’s awesome. 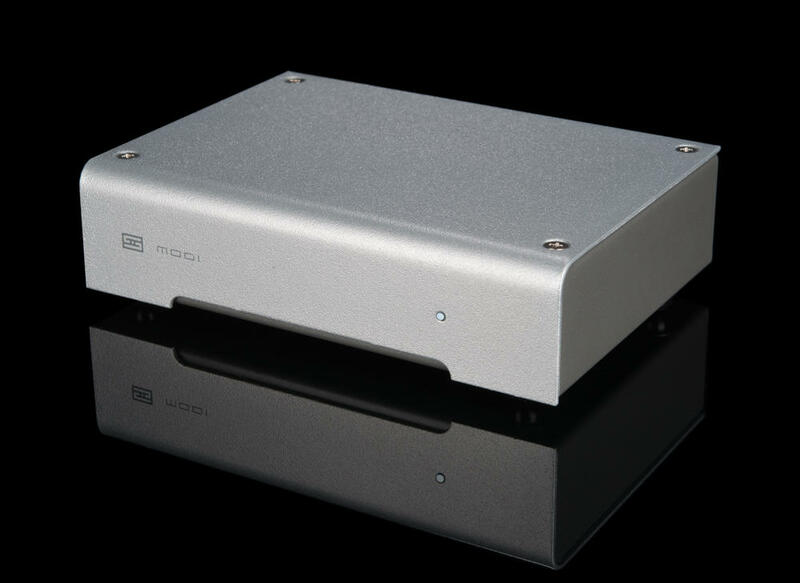 This thing is beautiful and highly-regarded as a top-notch async USB DAC for the (relatively low) $100 price point. Not too much to ask for a well-designed beautiful piece of audio gear, even if it is just a USB sound card. Unfortunately, no matter what I do, I can’t seem to get it to play nice with the pi. Occasional skips and pops plague the audio, despite trying all the tricks for getting it to work. Since a regular cheapo USB sound card works fine on the pi, I was suspicious. Feeding the Modi from my laptop works fine and the audio is fantastic. However, whilst plugging and unplugging during all my testing, I encountered a nasty flaw. If I walked across the room and then touched the beautiful metal case of the Modi, the audio would mute and slowly fade back. Occasionally, the Modi would actually jump off the USB bus entirely, and when it came back, audio would be distorted until I power cycled it. Being also into RF-related toys, I recognized this as some sort of static sensitivity, which often means design issues around grounding. Not cool. Yep, Modi can be static-sensitive. The solution: avoid touching it. Yes, it can be static-sensitive in some systems. The solution: move it where you won’t touch it. Okay, Nick, I get it. The thing is so beautiful, it needs to be in a glass case. Form over function, right? No thanks, this Schiit is going back. Schiit charges a 15% restocking fee on the Modi, so by the time I pay for the original shipping and return shipping, I’ll have paid for over a quarter of the device itself. That’s okay, maybe these guys can use the extra money to include some star washers in future products (that’s a grounding joke). One Response to Don’t touch my Schiit! Wow. That’s just absolutely unacceptable.